This is NO LONGER the OFFICIAL WEBSITE of the Pasay City South High School. To proceed to the official website just click the link below. All DepEd employees have been issued an official DepEd email account. You may activate your official deped email at this website. 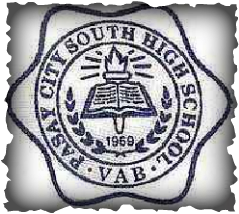 The PASAY CITY SOUTH HIGH SCHOOL is one of the seven (7) public high schools in Pasay City. The school compound is rectangular block in shape measuring 1 hectare situated at Piccio Garden,Villamor Air Base Pasay City. The facade of the main building faces the busy South Super Highways and the entrance of the school stands firmly along the perimeter road of Piccio Garden connecting the community where it caters. The community which is in the hub of Villamor Air Base is mostly populated by military dependents being once a military camp. Mindful of their economic standing most of the families engage in gainful activities, jobs and entrepreneurial pursuit to cope with the rapid development of the community. Villamor Air Base is now declared Tourism Zone in Pasay City. The emergence of the high rise commercial establishments like the Marriot Hotel, Newport Condominium ,Star Criuse, Resort World, Maxim, NAIA 3, well known food chains, Shrines and Museum etc. which are all extraordinary captures the attention of all. With these conspicuous structures and on-going projects in the dominant sites, it is evident that the community has improved and progressed a lot.